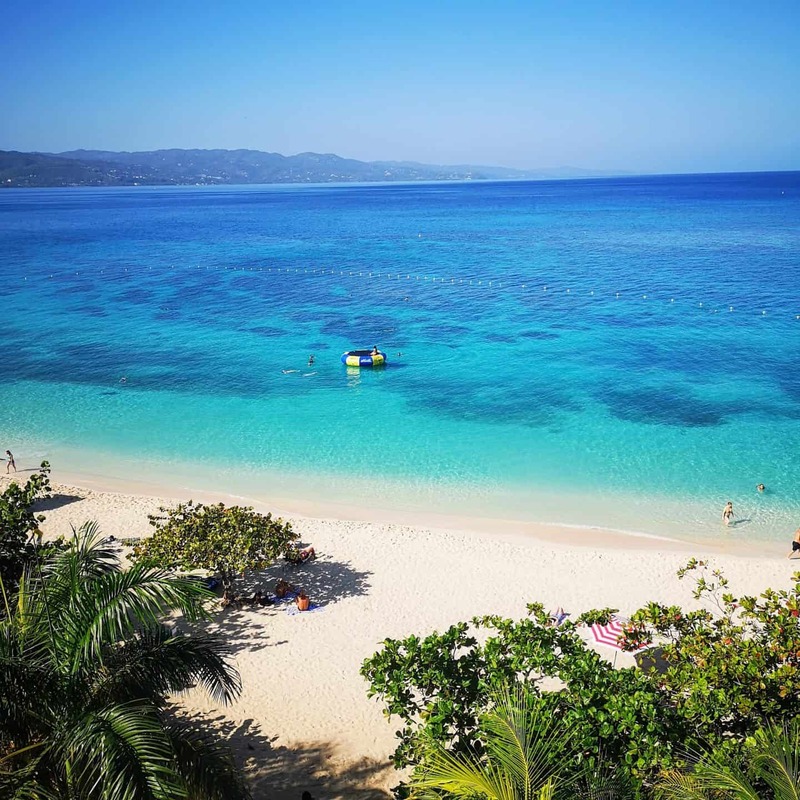 Planning a trip to Montego Bay, Jamaica? Montego Bay, Jamaica is one of the most beautiful destinations in the Caribbean. 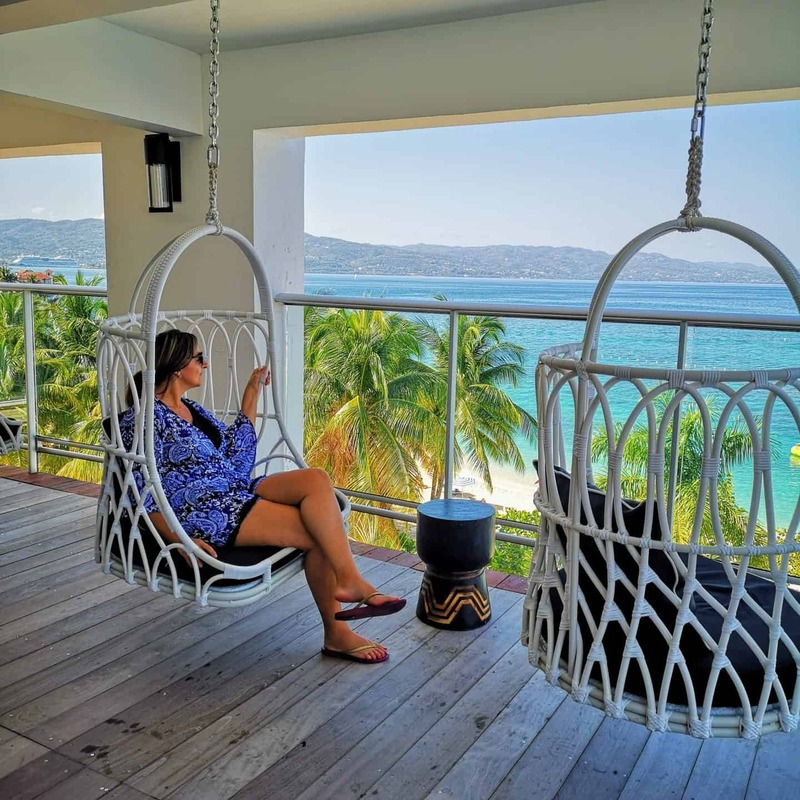 On my recent trip to Montego Bay, I was lucky to stay at the newly opened hotel in the heart of Montego Bay, the S Hotel Jamaica. 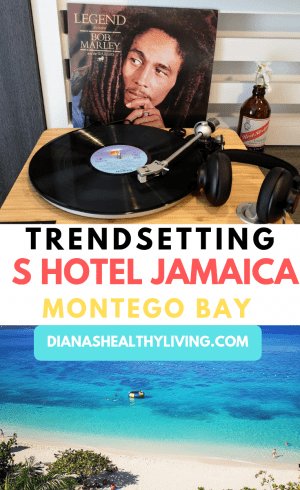 If you are looking for an entirely new experience from the all-inclusive resorts, then I would highly recommend that you check out the stylish S Hotel Jamaica in Montego Bay. The S Hotel Jamaica is the ultimate hotspot overlooking the famous Doctor’s Cave Beach. Montego Bay is the capital of Saint James Parish and is located on Jamaica’s north coast. It is a major cruise ship port with numerous beach resorts and golf courses outside its commercial core. 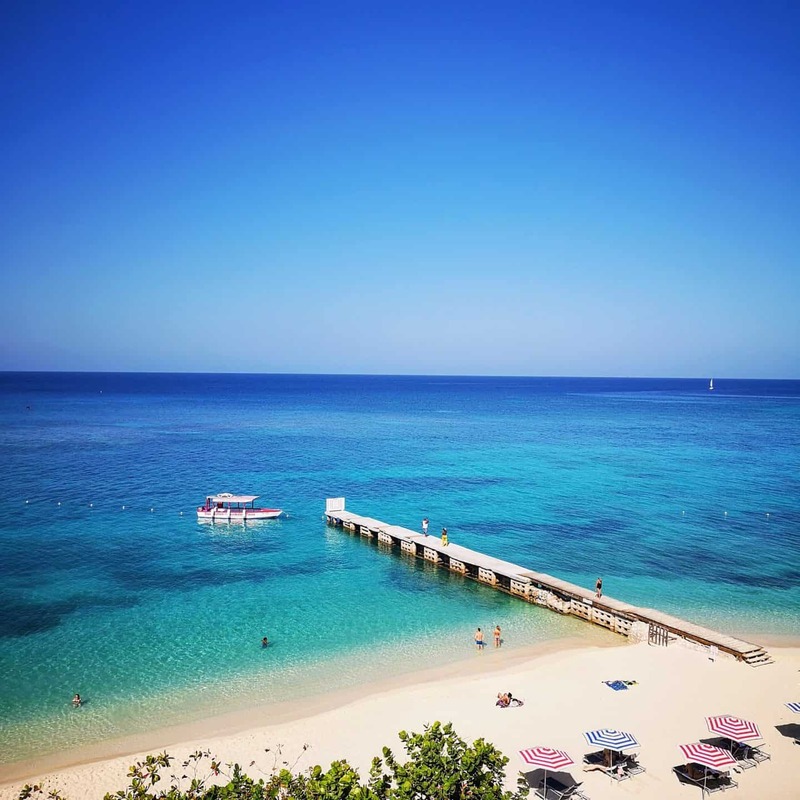 There are various activities to enjoy such as snorkelling and diving at coral reefs in the protected waters of Montego Bay Marine Park. There is also Chukka Caribbean Adventures that offers wonderful adventures for the entire family. 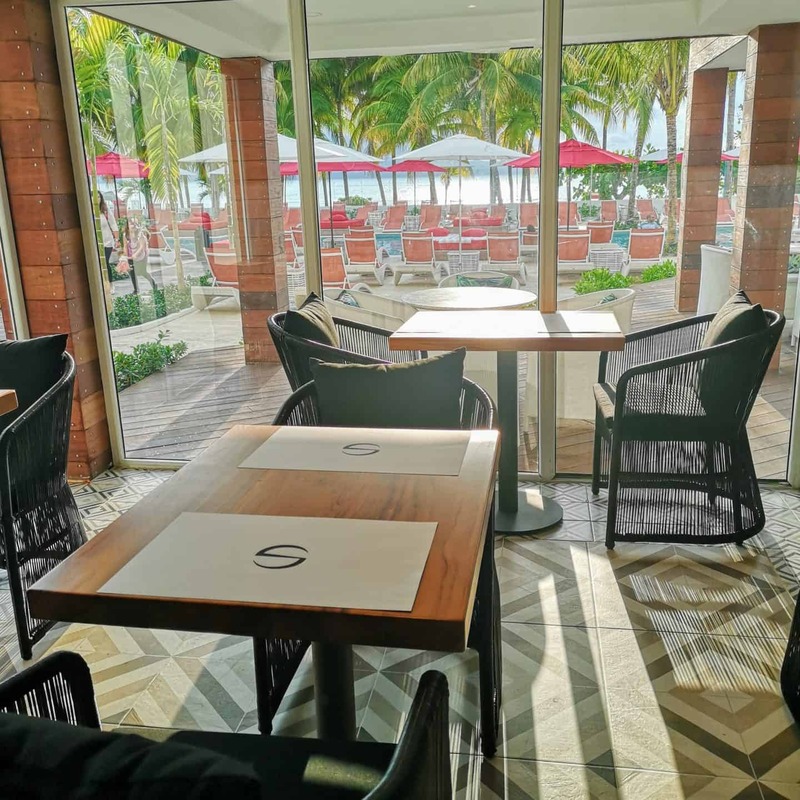 The S Hotel Jamaica is located a quick 8-minute drive from Sangster International Airport, Montego Bay. The hotel is located on the Hip Strip, that has been renamed to Jimmy Cliff Boulevard. The strip is home to some of the best waterfront dining spots in Jamaica. It also offers great stores to stock up on some souvenirs. I would recommend you stock up on some Blue Mountain Coffee and some rum. 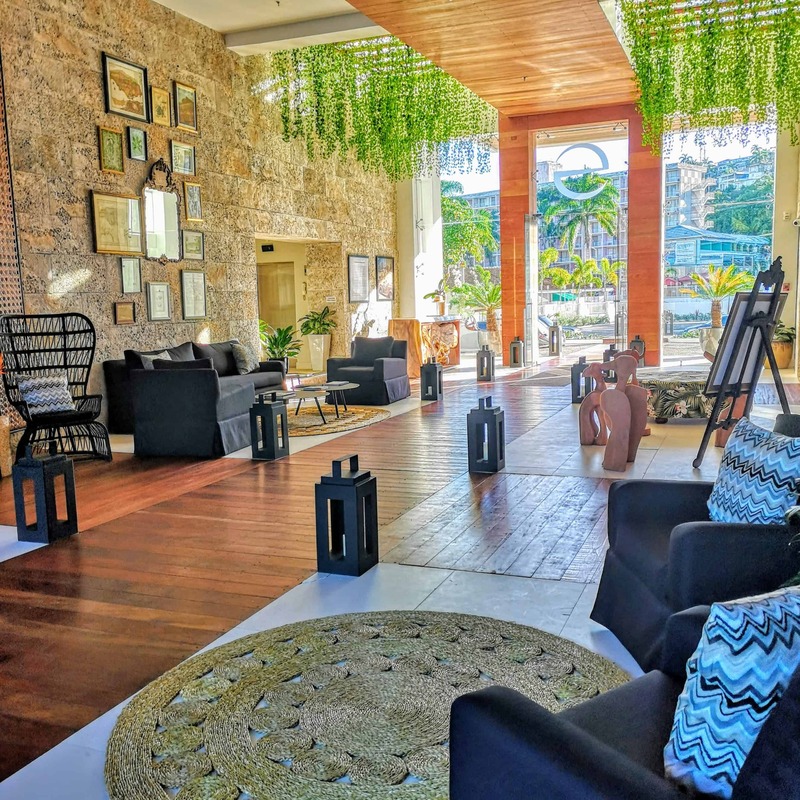 Once you enter the lobby of the S Hotel Jamaica, you can’t help but notice the towering 25-foot interior lobby walled with coral stone with greenery hanging from the ceiling. 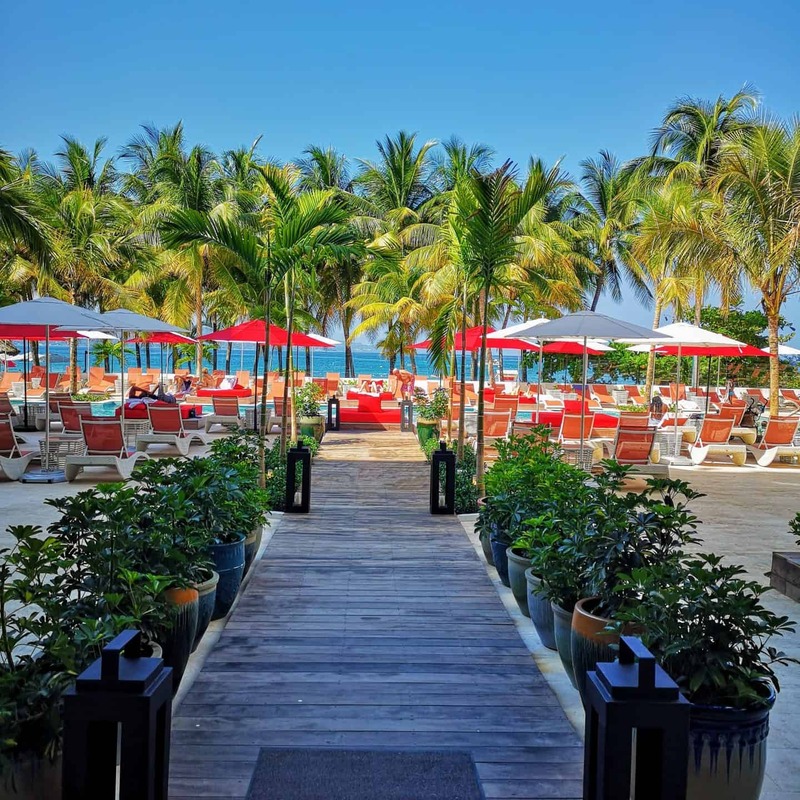 As you walk through the hotel lobby, you will be lured to the boardwalk that will lead you to the central swimming pool with lounge-worthy swim out cabanas, and beach chairs lined on the sleek wood deck. 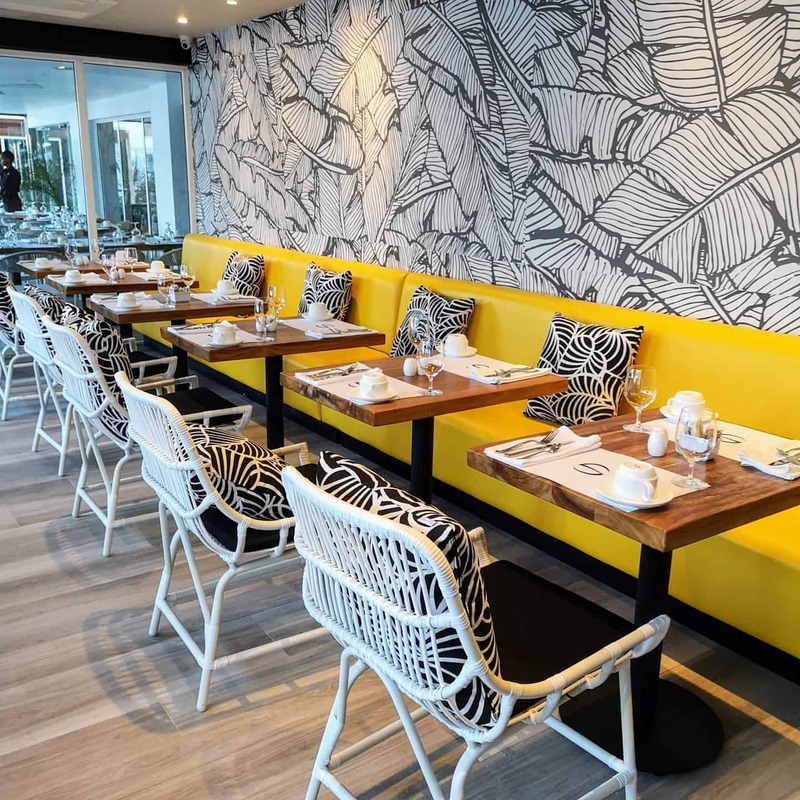 The decor of the hotel was spearheaded by a Miami-based luxury design firm, Antrobus Ramirez who directed the interior design of the hotel with Jamaica-born designer Alison Antrobus and design partner Ruby Ramirez. I love how they weaved Jamaican historical and cultural design elements in the hotel. You can see various artwork throughout the hotel. The 120 room hotel offers several levels of accommodations to choose from. The one thing that was pleasantly surprising is the size of the room. The rooms are extremely spacious and comfortable. I stayed in the Oceanview Spa Suite that has a king sized bed, large seating area, desk and let’s not forget about the large bathroom with double sinks and a large walk-in shower with three shower heads. The room has a large balcony offering amazing views of the beach and pool. 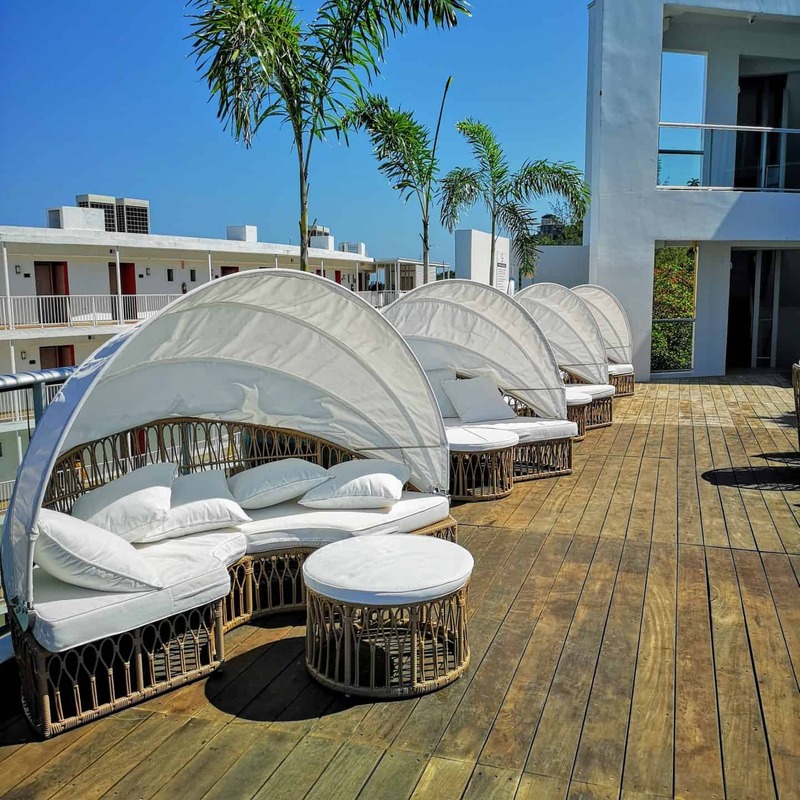 The rooms are sleek and luxurious, decorated in mostly white, giving it that Miami vibe with Jamaican accents such as a feature to the legend Bob Marley and the tasty Red Stripe Jamaican beer. The deluxe guest rooms are spacious and comfortable rooms with a balcony overlooking the Hip Strip. With a king or two double beds, a mini refrigerator, high-speed WIFI Internet; this is the perfect setting for business or holiday. Junior Spa Suites feature bathrooms with walk-in showers with three shower heads, an oversized sitting area with Juliet balcony and special spa amenities. A dramatically-designed king bed sits proudly while a pull-out twin sofa bed makes this an ideal room to share with family or friends offering up to 482 square feet of living space. 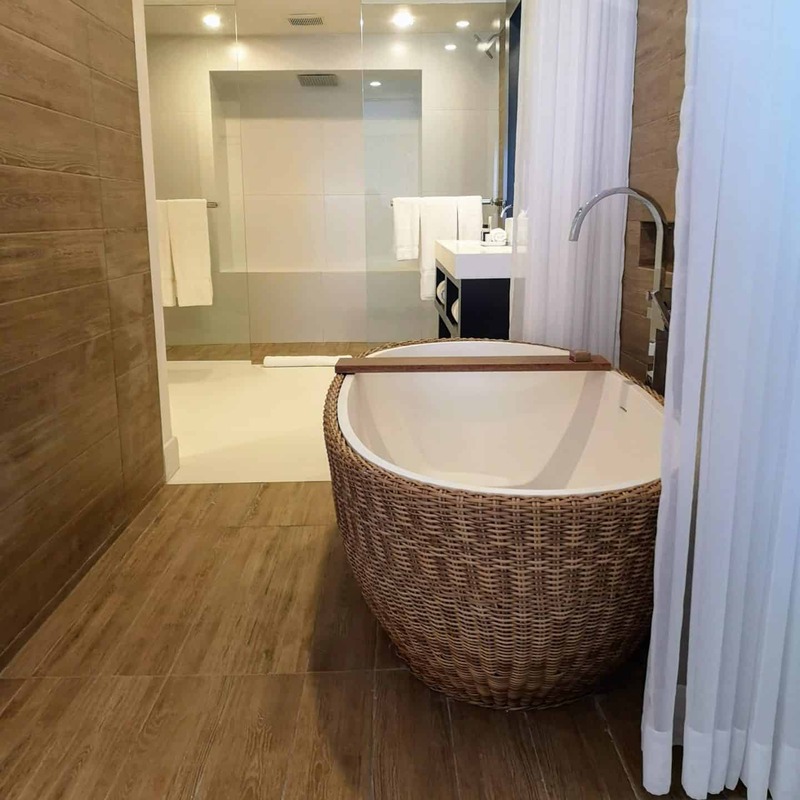 A custom-designed oversized bathroom gives way to an artfully designed guest room with sea view, sitting area plus a furnished balcony. A free-standing soaking tub and massive walk-in shower with three shower heads and special spa amenities. With a 20-foot high ceiling, the soaring windows offering sweeping views of the Sea, Beach, and hip strip. 1,000 square feet of indoor space with living area, kitchen, and a loft with a freestanding tub, separate shower, and walk-in closet. The S Hotel Jamaica has two pools to choose from. There is the main outdoor pool with beach chairs lined on a sleek wood deck with a luxurious resort-style atmosphere. Once you choose the right beach chair to catch some of that Jamaican sun, you will not want to leave. 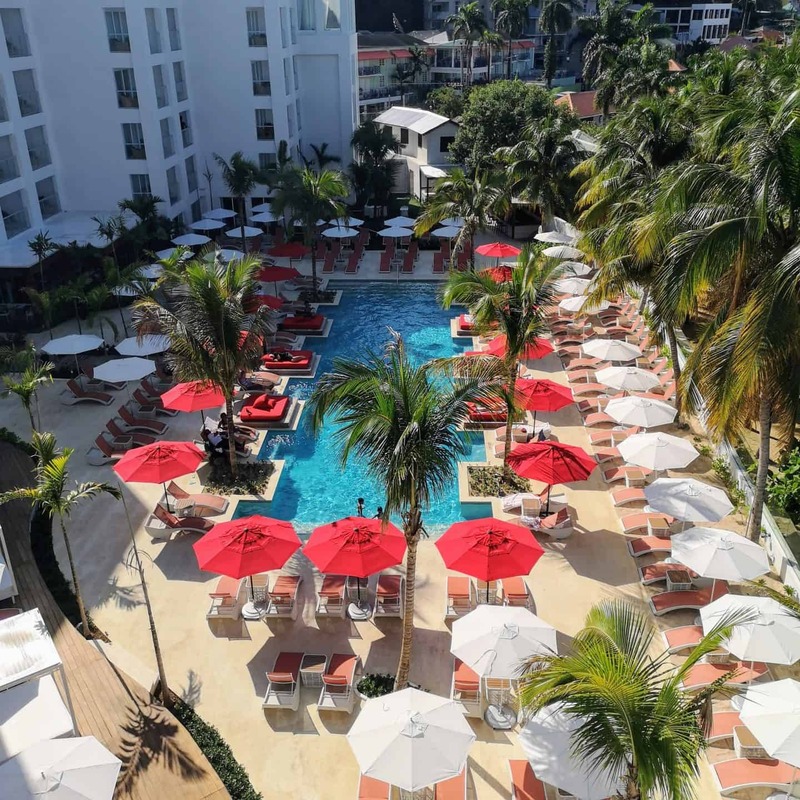 The S Hotel Jamaica also has an enviable glass-enclosed pool surrounded by cabanas and loungers where you will have the best beach views. The Sky Deck is the best place to get up early and enjoy the beautiful sunrise or to sit and end the night with a glass of wine as the sun goes down. 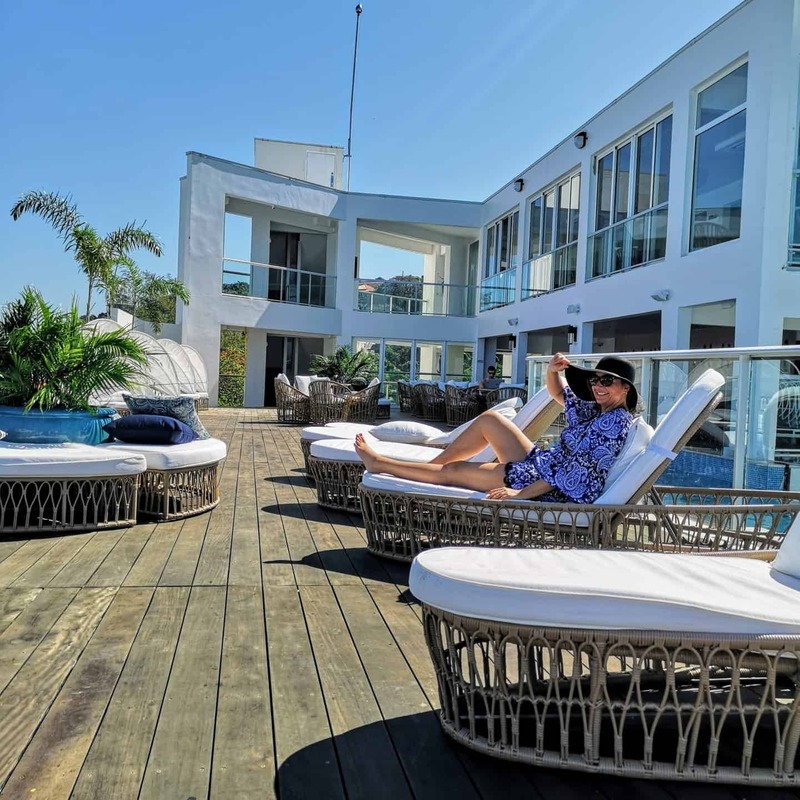 There is also a rooftop bar by the pool where they offer cocktails and a Jamaican tapas menu. The Irie Baths and Spa offers a holistic approach to wellness that features subterranean plunge pools with varying temperatures reminiscent of ancient baths, offering kinetic energy therapy. The spa features Natura Bissé, an international beauty brand, and locally made skincare products used in the treatments performed by expert therapists. 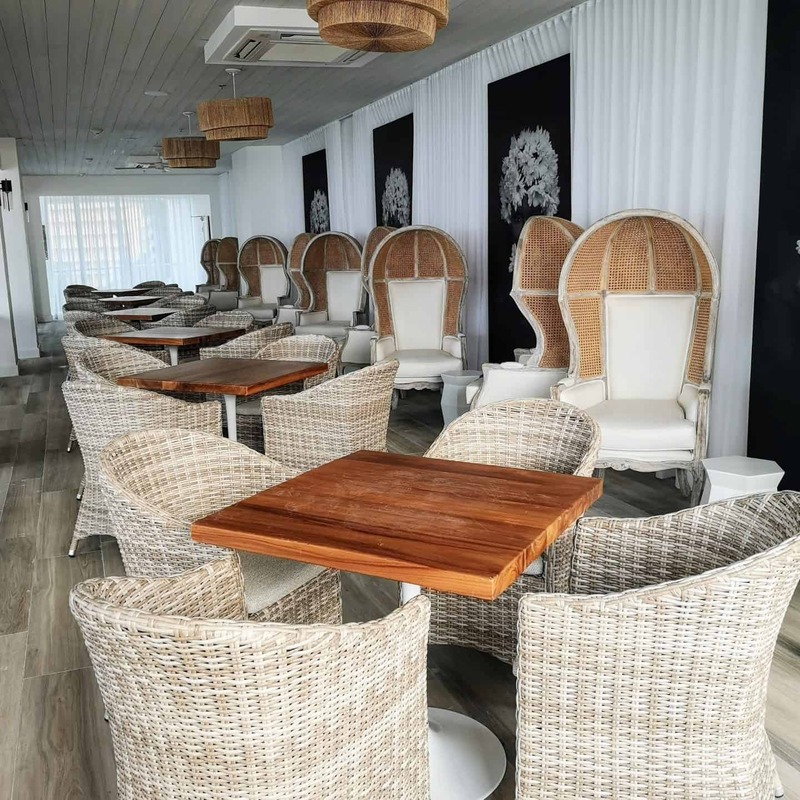 Treatments include manicures and pedicures with polish by Deborah Lippmann, Lycon waxing services and a variety of facials, massages and body scrubs using local cold-pressed coconut oil and essential oils. The Pool Bar & Grill uses top-shelf spirits and organic herbs to design inventive craft cocktails and straight-up classics, while an all-day menu offerss healthy snacks, made-to-order sandwiches, salads, and fresh juices. You don’t have to head far for your daily java fix. With views like this from the coffee shop, you won’t want to leave. The S Hotel Jamaica Sky Deck is the highest point of the property offering the ultimate sunset spot exclusively for Sky Club Suite guests. 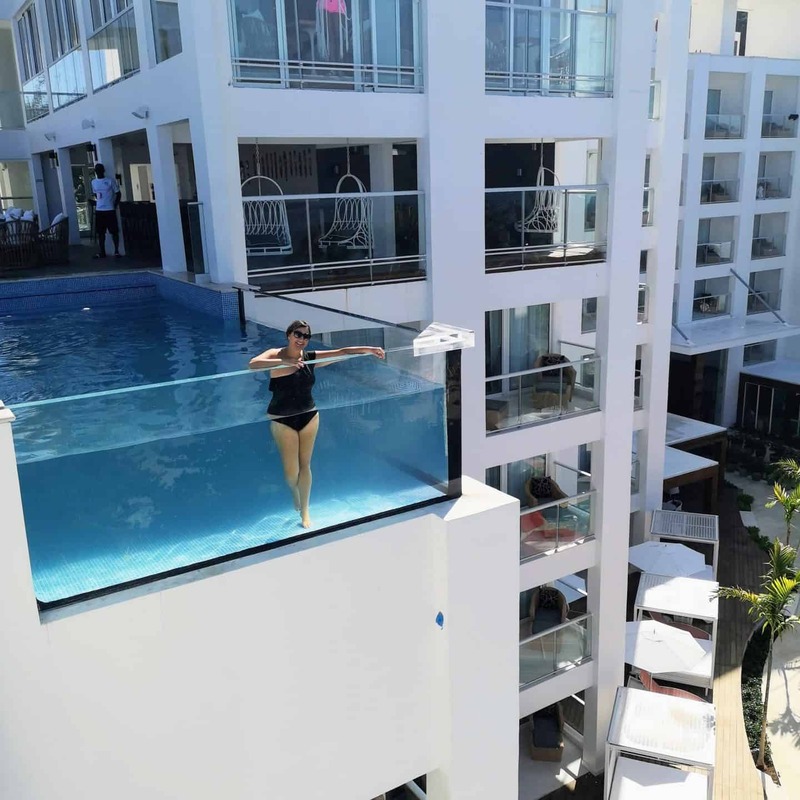 This is where you can cool off at the sky-high glass-enclosed infinity pool. You will be able to lounge by the pool while enjoying cocktails and Jamaican tapas. Tracks & Records is located in the St. James Plaza in front of the hotel. 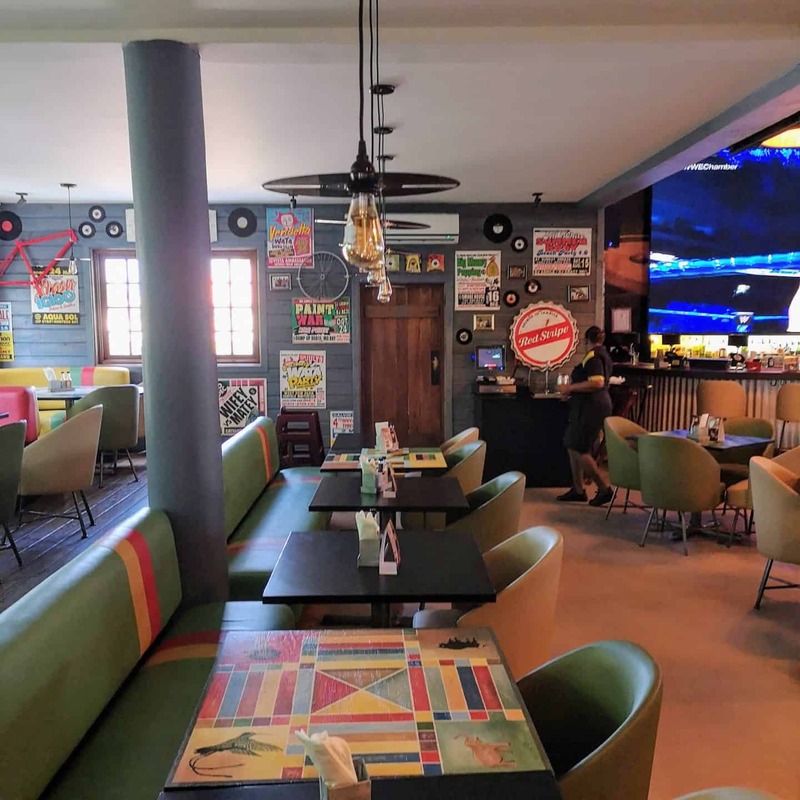 Tracks & Records has dedicated the restaurant to the Jamaican legend and probably the most naturally gifted athlete in the world, Usain Bolt. 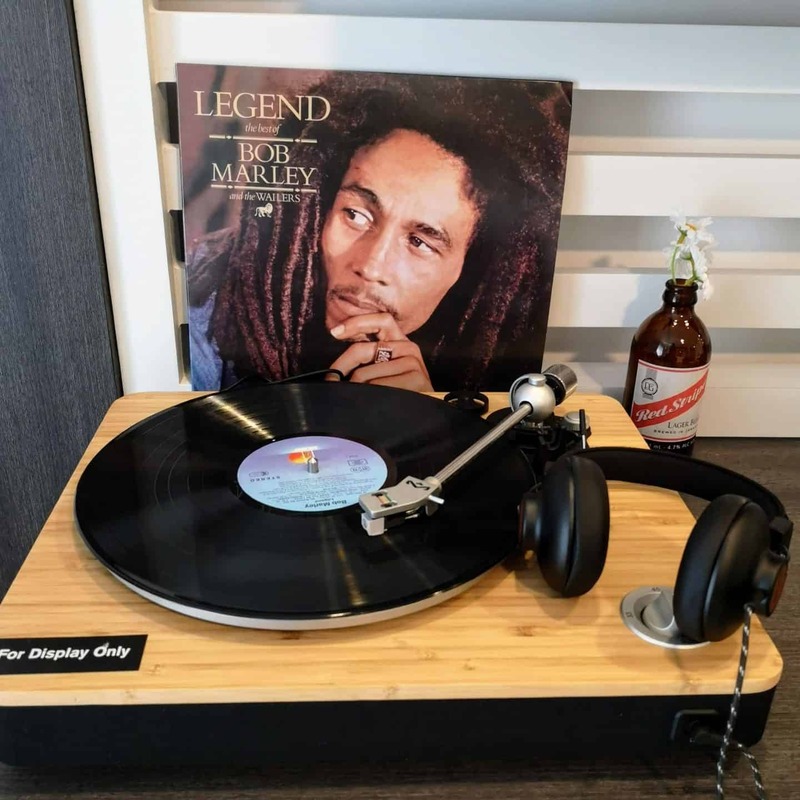 Tracks & Records combines real Jamaican flavours, sports, entertainment, music and Authentic Jamaican Vibes. I would recommend you start with the coconut and casava shrimp, they are so delicious. The hardest decision was deciding between the jerk pork or chicken. 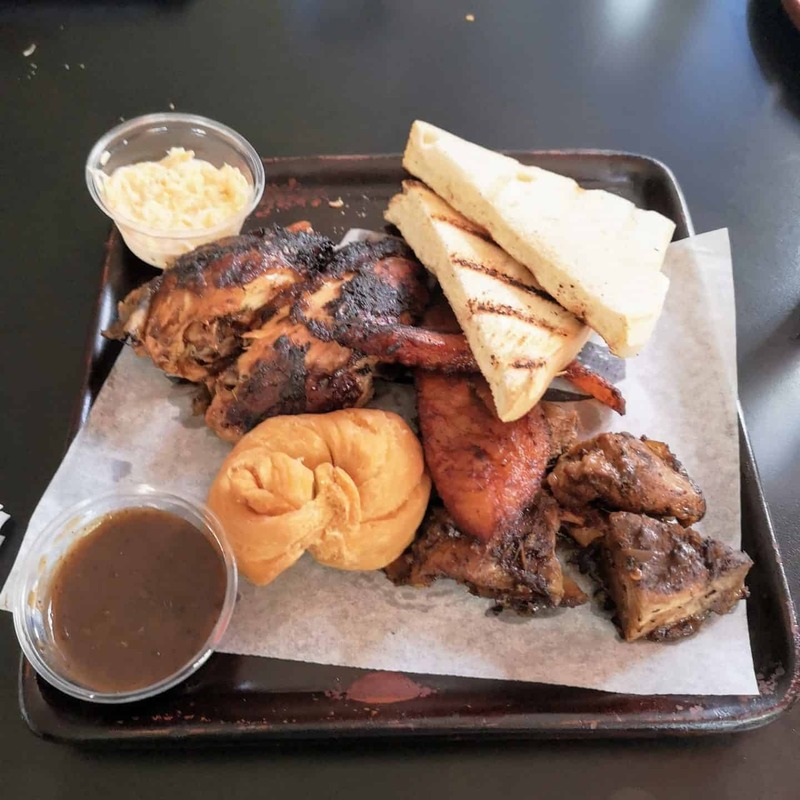 I decided to order the Jerk Platter that has an assortment of jerk pork and jerk chicken and is served with hardo bread, fried plantains, festival and coleslaw. Hardo bread is a white Jamaican bread that is slightly sweet. Festival is Jamaican fried sweet bread that is extremely addicting. The lobby bar is the hotel’s central meeting spot that serves a custom selection of wines, beers, Champagne and a full range of specialty house-made local elixirs. You must try the Jamaican rum punch. Doctor’s Cave Beach, Montego Bay has been one of the most famous beaches in Jamaica for nearly a century. It is noted for its crystal-clear turquoise waters and near-white sand. Its sheltered location provides calm waters. Doctor’s Cave Beach got its name in the 1920s from a famous British Osteopath who visited the beach and declared that the waters have curative powers. He claimed that he was restored to good health after bathing there. The Doctor’s Cave became famous overnight with foreigners who came to try the water. As a result, hotels were built in the immediate vicinity and this began the tourist trade in Montego Bay. I’m not sure if the waters have any healing powers, but the crystal clear turquoise waters will definitely lure you in. Have you been to Montego Bay, Jamaica?